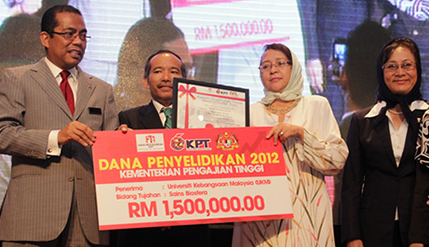 PUTRAJAYA, 5 July 2012 – The atmosheric science and health science groups at The National University of Malaysia (UKM) today received research grants of nearly RM7 million from the Ministry of Higher Education to undertake their researches. Health science was given RM5,479,300 while the atmospheric science group received RM1.5 million. The grants were handed over by the Minister of Higher Education, Dato’ Seri Mohamed Khaled Nordin at a ceremony at the ministry here today. Dato’ Seri Khaled said the government has allocated a total of RM170 million as grants for 1,425 researches being carried out in public and private universities as is confident of their outcome. The government is hopeful that the grants will result in findings that can have positive impacts on the country’s development and transformation. The ministry will set up a committee to assess the outcome of the grants on the researches and set up a formula to assess the impact of the research findings on the gross national income. The ministry is aiming at producing at least 1,500 graduates with masters and doctorate qualifications during the 10th Malaysia Plan period of 2011-2015 and is hopeful of getting 6,000 of the findings published in established journals and 500 intellectual properties. He hoped that the private sector will reciprcate the govenments efforts by increasing their allocations for research. He said that an advanced society is one which invests enough in research and development so that the search for knowledge becomes a culture of the nation. Senior officials of the ministry, Vice Chancellors of public and private universities and researchers attended the function.